Update your table setting with this lovely square and round 16-piece dinnerware set from Rachael Ray. This casual stoneware dinnerware is both microwave and dishwasher safe. So good we bought it twice. Its a beautiful set. Very functional. Bowls are deep. Plates have a large lip.. makes it easy to eat watchin TV.They're perfect. I would not recommend these dishes to a friend. After receiving them I loved the cobalt color, however,due to their square center shape, they are very irregular in shape and do not stack well. As a result, they do not fit well in standard cabinets. I returned them and lost quite a bit of money on the deal due to the weight of each package. I lost about 40% of my purchase price. DO NOT buy these and think twice about any Overstock item that is heavy and will cost a lot to return. 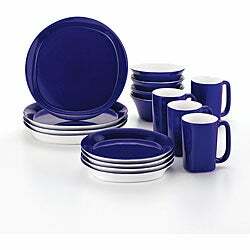 I purchased two sets of the Cobalt (great color) for our vacation home. They are wonderful, with a unique square deep dish. I placed them on chargers at the table and the look was fabulous! I have had a lot of dishes over the years, and these are by and large the greatest microwaveable dishes I've ever had. My food gets hot but the dishes don't. I've seen some complaints about stacking and I'm not sure what that's about. Either a quality control issue or someone smashing plates together. I've had mine for almost six months, likely been through 20 or more loads in the dishwasher, and I stack them all except for the mugs. There's not a single scratch on any of them. Oh, they look great as well -- I think the blue looks classy. This set is absolutely NOT microwaveable. It gets so hot that it will burn your hand. I just microwaved one of the salad plates for 1.5 minutes and the plate broke in half!!!! In addition, the bowls and plates started chipping about a month after I got them. I am so disappointed. I am not cheaping out again--I went to Lenox's website and ordered new dinnerware. This stuff is awful-Rachel Ray wouldn't use this garbage. I was very happy with these dishes, they are exactly what I have been looking for! They are very sturdy and I really like it that they have a lip around the dish so food stays on the plate. I would highly recommend this produt!! These are the perfect color that I was looking for. They are a little heavier than my old dishes, thicker. So they do take more room to store. The set was "ok". Inside of cups became scratched from normal use. I wish I knew how heavy this dishware was before I purchased it. It is beautiful but ceramic dishware weighs a lot more than I had anticipated. Loved the heaviness. Very nice. Heavy, difficultly fitting on 10 inch standard shelf; chips easily. Hi rjschaefer, coated with a smooth, lead-free glaze. Please feel free to contact us again with any further questions. Thank you for shopping with us! I have had my set for a year and a half, I am going to trash it. The white inside the bowls and cups are becoming scratched by the spoons. I no longer feel safe with this dishes. I will no longer recommend this product. "where was this product manufactured?" Thank you for your inquiry. This item was made in China. "Do these come in other colors, and can you mix & match?" Unfortunately, you cannot mix and match, but there are other color options. You can view all the options at http://www.overstock.com/search?keywords=Rachael+Ray+16-piece+Round+and+Square+&SearchType=Header.